This isn't the first time I've posted about my love affair with pearls. You can see my posts on pearls here, here and here. I love how a pair of pearl earrings, either studs or delicate drops like my favourites, above, elevate whatever I'm wearing to 'classy'. 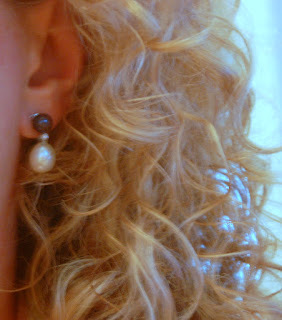 I've often read and heard, that the only earrings one really needs, is a pair of pearl studs, and some diamonds. Nice, if you can get 'em. If not, there's always the faux kind! I recently stumbled across an old style bible I'd had for years and years. ...and finally this lady, who I think would look at home in any corporate environment, even now. What's the one thing that dates these photographs, seating them firmly in the 1980s/1990s? It's the BIG earrings, the STATEMENT earrings, the BOLD earrings, the OVERSIZED earrings. In case I haven't made the point clearly enough, in every single instance, it's the EARRINGS that date their look. Sure if you look more closely there's a bit too much earthy blusher happening, and they're all rocking the overgroomed hairstyle of that era, but honestly, I can forgive that. But those earrings. Gosh. Did we all really wear them? Do you still wear them? Is it time for a new pair of earrings in your wardrobe of accessories? I think these photos are a perfect argument, for one pair of pearl studs, and a nice pair of diamond ones. When I think what I've spent on earrings in my lifetime...yes of the oversized bold type, the chandelier type, the gypsy hoop type, the clip-ons, the strands, the chains...it goes on and on....I could have had the best pearls and diamonds on the planet. And more than one pair if I really wanted. Do it. Treat yourself to a pair of good pearl earrings. Layby them if you have to. Buy vintage or estate if you can...they have more lustre through being worn. And if you really cannot spare the cash, splurge $10 on a pair of decent faux ones. They're everywhere. Wear them constantly, and enjoy the way they make you feel. And start saving for the diamond ones. Hi Mimi, thanks for your encouragement to be the best we can be everyday.I have never had my ears pierced. Is it possible to still be stylish without earrings? I have lived 47 years without them. thanks most sincerely for another so lovely post of yours ! I also love pearls, just the earrings you've posted in the first photo, they're quite simple but so elegant at the same time ! Mimi you're a woman after my own heart. I have two pairs of earrings that I wear all the time. I have a pair of black freshwater pearl earrings that I bought whilst on my African safari two years ago. They are small and are an odd oval and lumpy shape. I also have a pair of diamond studs that my lovely Bluey bought for me for our 25th Wedding Anniversary a number of years ago. I have a number of other pairs but these two are my favourites. I glued my glitzy 80s earrings to silver napkin holders. I use them for fun tea parties. My neighbors 5 yr. old daughter fell in love with her, oh, so beautiful napkin ring. When my MIL downsized, she gave me all her old costume jewelry. You can immediately see the 80's styles, but the older ones from the 40's & 50's are just beautiful and I often wear them. The quality is great. I do love pearls, but I love all earrings in general. I love changing them, I love the colored crystals, etc. I've never been a fan of diamonds- my husband couldn't believe I didn't want one for our engagement- I got an emerald cut garnet!- I love the colors too much. Peridot and golden topaz and garnets and green tourmaline and fire opals and and and....I'm a colorful girl! Another ideas for those large earrings that have post backs? Bulletin board tacks! On my bulletin board, you'll find old earrings and tack pins from awards, vacations, or whatever. They're fun to look at. Memories!